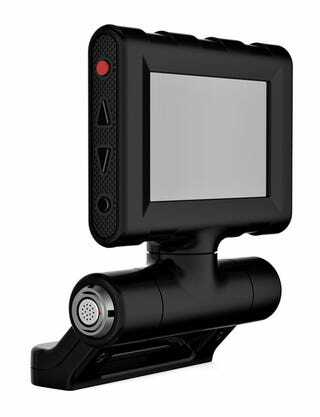 Red Mini LCD—will show you what the camera is framing in real time. Red Pro I/O—which has HD-SDI out and HDMI out, two channels of Balanced Mic Audio in, one headphone out, 48v Phantom power, RS-242, and a Genlock/GPIO. Red Gunner—which will allow the user to aim their custom Red like a rifle. Red Volt—a hot swappable battery. Red Bomb Electronic View Finder—which connects to the Red bodies. Red Scarlet—the final look for the 3K HD pocket pro camera. REDmote—this remote will allow for remote control of both Epic and Scarlet. Red Epic—the body of Red's highest end 5K camera.